Mysterious doodles on a 17th-century manuscript provided Liz Kenny with the inspiration for this fascinating disc. The ownership of the ML Lutebook has been attributed to a number of court musicians from its discovery in 1912, but it was the name ‘Margaret’ occasionally scrawled throughout the copy which caught the contemporary performer’s imagination. Kenny writes that ‘this chimed with the train of thought that was beginning to focus on what and who these books were compiled for, rather than on any single composer who wrote them, and put it in line with other books belonging to Jane Pickeringe and Margaret Board (lute), Elizabeth Rogers (virginals), and Lady Ann Blount (singing), where a remarkable level of virtuosity was associated with private performance by women. There are plenty of great men and great tunes within its covers but ‘Margaret’ has remained in my mind over the years that I’ve been fascinated by the book’. The Flying Horse (track 24) is an anonymous piece that seems to sum up the spirit of the book, a ground bass spiced up with an exotic chord of A flat and an incitement to improvise. Works by Dowland, Johnson, Bacheler, Sturt and others summon up an exhilarating musical world influenced by the court, the theatre and the cries of the street, and where mansucripts, passed from hand to hand, became palimpsests of the perfomer’s own art. 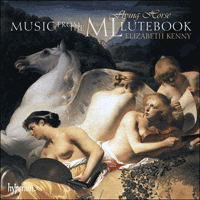 Liz Kenny, arguably the greatest lutenist of today, performs this entrancing collection with an aplomb and flair that seems to directly channel those virtuoso performers who were handed the music with the ink still wet on the page. What’s in a name? When the British Library acquired Add MS 38539 in 1912 it was mooted that the initials ‘ML’ on the cover possibly referred to Matthew Locke. A nice try though this was to fit in with a ‘great men of music history’ model, it was revised when these initials were shown to have been stamped before Locke was born, and the volume was then referred to by its less alluring catalogue number. When the early-music movement was under way and ‘not quite so great men’ came into the picture, it ended up being called the Sturt Lute Book, on the hope or assumption that Sturt, who was one of Prince Henry’s lutenists, compiled it in the 1620s (a handful of the pieces in it are by him). In his facsimile edition of 1985 Robert Spencer re-branded it simply ‘ML’, with a cautious link to one ‘Margaret’ (or ‘Margareta’ or ‘Marg’) who doodles her name on some of its pages. This chimed with the train of thought that was beginning to focus on what and who these books were compiled for, rather than on any single composer who wrote them, and put it in line with other books belonging to Jane Pickeringe and Margaret Board (lute), Elizabeth Rogers (virginals), and Lady Ann Blount (singing), where a remarkable level of virtuosity was associated with private performance by women. There are plenty of great men and great tunes within its covers but ‘Margaret’ has remained in my mind over the years that I’ve been fascinated by the book. Some of the pieces in the book may be records of Margaret’s lute lessons—maybe with Sturt, certainly with a member of the inner sanctum of the Jacobean court, where masque and theatre as well as avant-garde chamber performances were being planned. Her namesake Margaret Board also practised her signature in her lute book, but her lute-playing story ended unambiguously on her marriage and the book was passed on. ML wasn’t simply handed over from one person to another when they’d finished with it: there are fifteen different hands involved in it, some of which appear to have been entering music contemporaneously, for example by filling up the odd gap at the bottom of a page, then handing the book back to the next or the previous writer. Whatever its purpose, it is a collaborative volume par excellence. Margaret may have been the patron-witness-pupil to hand: lute players were debating the state of their art, commenting on each others’ music, borrowing each others’ tunes, and perhaps wondering where they had collectively ended up after the confident Golden Age of the Elizabethan lute. Lutes had acquired extra bass strings since the boyhood of John Dowland, which meant that bass notes were added to both older and newer tunes: so much for the ‘original’ intentions of the composer. Running passagework (the Renaissance style of division writing) using the thumb and index finger is notated alongside newer trends of using the thumb for the bass alone, with the fingers of the right hand playing the fast notes. An expressive—or, depending on your taste, hyperactive—layer of left-hand ornaments or graces is larded on top. One of the most significant concordant sources for the book, Kraków Mus. MS 40641, has neither the French-style dotted rhythms nor the ornamentation for the dances in ML. The music is often performed without them, or with relatively few, following the plausible logic of Adolf Loos’ provocatively titled essay Ornament and Crime (1908, translated into English in 1913). This essay was widely associated with the arts and crafts movement—itself bound up with the discovery and reconstruction of old instruments, which sought to distinguish fashion from substance and usefulness. While the sort of ornamentation found in ML was undoubtedly a fashion and distorts the smoothness so prized by Loos in physical objects, as perhaps by us in musical melodies, there is much also to be gained from this obsessive manipulation of the natural decay of the string. The exploration of emotional expression in left-hand graces would become associated with the portrayal of feeling in the school of the French lutenists that followed. Here it is as if two photographs are superimposed, as this almost baroque use of ornamentation is applied to Renaissance musical forms. Mersenne remarked that it was sometimes difficult to decide whether a grace should begin a whole or a half tone away from the main note, which is a reminder that deceptively modern-sounding tunes weren’t always subject to our sense of key; leading notes weren’t automatically raised in scales until much later in the century (scholars seem to converge on a range of dates around 1680), enlarging the range of colours available through a wider choice of accidentals chosen to suit the character of the musical phrase or simply to exploit the sound of where an ornament might lie on the lute. French-style coulés and appoggiaturas are added in the book to the music of Robert Johnson. The sharp and cross signs are found in other sources, though not in the profusion they are here, suggesting a wide variety of interpretations would be required for there to be any point to them at all. In The Battle, for example, I found it hard to resist trumpet-like leaps of a third from the open string. Despite having a court appointment, the distinguished Elizabethan lutenist Antony Holborne seems to have died owning very little, according to his ‘desolate and distressed wydowe’ who wrote to Sir Robert Cecil in 1602, begging for expenses for his funeral. It is a sad irony that his nobly melancholic piece included here was of more use to later generations than it was to his own family. The other three Pavans here are by Robert Johnson. Johnson and Dowland are the Handel and Bach of their worlds; it should be no surprise to learn that Johnson, like Handel, was capable of the most extraordinary profundity, but his micromanagement of every aspect of masque performances, from buying strings to writing large swathes of music, and his administrative and musical production duties for Shakespeare’s company The King’s Men predispose us to imagine a genial man of the theatre rather than a private genius. Both C minor Pavans explore the darkness of the lute’s lower strings. The handwriting of the second is a not very elegant version of secretary hand which seems to match the haunting provisionality of some of the writing: lines of counterpoint which melt away rather than develop, as well as rhythmically fragile bits of style brisé, where inner parts and the tunes wind in a delayed fashion around the bass. Echoes of Dowland’s Lachrymae theme hover throughout, leaving a dark sense that the world is more complicated than when the older tune was written. In the F minor Pavan I was unable to forgo the divisions in Lord Herbert of Cherbury’s Lutebook, with their eloquent testimony to a tradition where one person’s composition is the spur to his own or another performer’s imagination. Daniel Bacheler’s Galliard shares its tune with his setting of the Earl of Essex’s sonnet ‘To Plead my Faith’, one of a series of pieces in which, as Fulke Greville famously remarked, Essex was wont to ‘evaporate his thoughts’, usually on the subject of his unjust treatment by Queen Elizabeth I. Dowland ratcheted up the complexity of this with his own Galliard, and then the ML writer added another layer of competition with his trademark left-hand business. ‘Boys, boys’, one can almost hear Margaret murmur, or perhaps she was duly impressed and rattled off both pieces herself. The tune seems to have attracted improvisation, as it survives in Giles Earle’s songbook (c1615–26) with elaborate divisions that are an equally challenging mix of moving, difficult, brilliant and silly. Lutenists and singers at this time were vigorously exploring issues of technical display and emotional sincerity: as someone who has cajoled singer-colleagues into doing the same, there is an element in this recording of putting one’s lute where one’s mouth is. There are several sources earlier than ML for The Battle. Dowland’s Galliard that appeared in Robert Dowland’s Varietie of Lute Lessons (1610) as The King of Denmark’s Galliard here has its other name, The Battle Galliard, making the link with The Battle as explicit as the trumpet-call tune they both share. John Ward suggested that a version of The Battle might have been played while a spectacle was going on, which is not unlikely, but is a kind way of indicating that musically speaking very little happens. Without breaking a musical butterfly upon the wheel of cultural theory, music undoubtedly had a part in the mirroring and digesting of cultural experiences which were in their own way highly theatrical. There is a palpable tension as the trumpet calls and stylized manoeuvres keep going on and on, until the actual battle explodes with the force of this pent-up expectation, and then is over rather quickly, with a kind of victory passamezzo which fails to contain completely the energy that has just been unleashed. French dancing masters instilled the courante/coranto rhythm in the bones of the aristocracy during lengthy rehearsals for masque performances, and their combination of rhythmic ambiguity and tunefulness made them something of an obsession. Most obviously associated with cheerful sprung rhythms the form was considered large enough to accommodate the kind of musical Testament that the previous generation would have housed more naturally in a Pavan (see the pieces by Holborne and Perrichon). The directness of some of their melodies seem to me to suit the treble lute, the instrument with which Jacques Gaultier delighted audiences during his thirty years in England from 1617. He seems to have delighted his colleagues a lot less—records of murderous fights and royal intrigue abound, but the Gallic charisma he brought with him was inescapable. Into this cross-channel and cross-generational melting pot were thrown old favourites such as the song tune John come kiss me now, tunes made familiar in the theatre (The Noble Man, Gray’s Inn Maske, The Prince’s Almain and Hit it and take it) and Tom of Bedlam. The Noble Man may have been written for a now-lost play of the same name by Tourneur, or for a masque performed in 1613. Tunes were coming apart from their host masque or theatre performances almost as soon as they were written—Johnson’s The Prince’s Almain appears in ML as ‘Allmayne by Robert Johnson’, which shows that their afterlife depended on what they represented: elite theatrical performance and a memorable tune. Which particular show they were from was of lesser importance, resulting in what Peter Walls has called a ‘bad dream’, or scanty or misleading attributions, for scholars. A player’s job was to get hold of them somehow and to put them into his or her own voice. On n’a pas toujours le nom que l’on mérite. En 1912, lors de son acquisition par la British Library, le manuscript Add MS 38539 était supposé avoir appartenu à Matthew Locke. Mais cette belle tentative pour le faire coller avec un des «grands hommes de l’histoire de la musique» fut battue en brèche quand on découvrit que son contenu était un peu antérieur et il retrouva alors son libellé de catalogue, moins séduisant. Lorsque démarra le mouvement de la musique ancienne et qu’apparurent dans le paysage des «hommes pas tout à fait aussi grands», on finit par l’appeler le Sturt Lute Book, en espérant, ou en supposant, que Sturt, l’un des luthistes du prince Henry, le compilât dans les années 1620 (quelques pièces sont de lui). Dans son édition en fac-similé de 1985, Robert Spencer lui recolla l’étiquette «ML», d’après les initiales de la couverture, prudemment reliées à une certaine «Margaret» (ou «Margareta», ou encore «Marg») qui griffonna son nom sur quelques pages. Violà qui cadrait avec le courant de pensée alors en train de se focaliser sur le pour quoi et pour qui ces livres avaient été compilés, plutôt que sur l’identité de leur compositeur; et cela le mettait au même rang que d’autres livres appartenant à Jane Pickeringe et à Margaret Board (luth), à Elizabeth Rogers (virginal) et à Lady Ann Blount (chant)—des livres où les exécutions privées données par des femmes n’excluaient pas un remarquable niveau de virtuosité. Ce manuscrit renferme nombre de grands hommes et de grandes mélodies, mais durant toutes ces années où il m’a fascinée, «Margaret» ne m’est jamais sortie de la tête. Certaines pièces de ce livre pourraient refléter des leçons de luth de Margaret—peut-être avec Sturt, en tout cas avec un membre du saint des saints de la cour jacobéenne où étaient organisés des masques, du théâtre et des concerts de musique de chambre avant-gardistes. Une autre Margaret, Board celle-là, apposa aussi sa signature dans son livre de luth mais son histoire avec cet instrument cessa net le jour de son mariage, et le livre changea de main. Le manuscrit ML ne fut pas juste transmis dès qu’on en avait fini avec lui: quinze mains différentes y sont intervenues, certaines paraissant avoir entré de la musique à la même époque, comme pour combler, par exemple, le curieux vide au bas d’une page, avant de remettre le livre à l’auteur suivant ou précédent. Quel qu’ait été son dessein, ce volume est l’ouvrage de collaboration par excellence. Margaret fut, peut-être, la première mécène-témoin-élève venue: les luthistes débattaient de l’état de leur art, commentaient mutuellement leur musique et s’empruntaient des mélodies, voire se demandaient ce qui leur était arrivé après le puissant âge d’or du luth élisabéthain. Le luth avait gagné des cordes de basse supplémentaires depuis l’enfance de John Dowland, et les anciennes comme les nouvelles mélodies se virent adjoindre des notes graves: mieux vaut donc oublier les intentions «originales» du compositeur. Les passages rapides (le style renaissant de cet ornement qu’est la «division») requérant le pouce et l’index sont notés aux côtés d’usages plus récents, où le pouce sert pour la basse seule, les doigts de la main droite se chargeant des notes rapides. La partie supérieure est bardée d’une couche expressive—ou hyperactive, selon vos goûts—d’ornements ou d’agréments à la main gauche. L’une des plus importantes sources concordantes de ce livre, Kraków Mus. MS 40641, n’a ni les rythmes pointés de style français de ML, ni l’ornementation de ses danses. La musique est souvent jouée sans tout cela, ou presque, conformément à la logique plausible d’Adolf Loos. Son essai au titre provocateur, Ornement et crime (1908, traduit en anglais en 1913) fut largement associé au mouvement de l’artisanat d’art, lui-même lié à la découverte et à la reconstitution d’instruments anciens—domaine où l’on chercha à faire le départ entre mode, substance et utilité. Si le type d’ornementation présent dans ML résulte incontestablement d’une mode et qu’il distord la régularité que Loos apprécie tant dans les objets matériels et que, peut-être, nous apprécions tant dans les mélodies musicales, nous avons aussi beaucoup à gagner à cette manipulation obsessionnelle de la dégradation naturelle de la ressource. L’exploration de l’expression émotionnelle dans les agréments à la main gauche s’en trouverait associée à la représentation du sentiment dans l’école des luthistes français immédiatement postérieure. Quand cet usage quasi baroque de l’ornementation est appliqué à des formes musicales renaissantes, on a l’impression de deux photographies superposées. Selon Mersenne, il est parfois difficile de déterminer si un agrément doit commencer à un ton entier ou à un demi-ton de la note principale, ce qui nous rappelle que ces mélodies aux allures fallacieusement modernes ne furent pas toujours soumises à notre sens de la tonalité; les sensibles ne furent systématiquement haussées que bien plus tard dans le siècle (les spécialistes s’accordent sur 1680, environ), élargissant la palette des couleurs disponibles grâce à un choix plus vaste d’accidents à mêmes d’épouser le caractère de la phrase musicale ou juste d’exploiter la sonorité de l’endroit du luth où un ornement pourrait se trouver. Dans le livre, les coulés de style français et les appoggiatures sont ajoutés à la musique de Robert Johnson, suggérant la nécessité d’une grande variété d’interprétation. Dans The Battle, par exemple, j’ai eu du mal à résister aux sauts de tierce, façon trompette, depuis la corde à vide. Bien qu’ayant été nommé à la cour, l’éminent luthiste élisabéthain Antony Holborne mourut en laissant apparemment très peu de biens, du moins à en croire sa «veuve désolée et dans le besoin» qui écrivit à Sir Robert Cecil en 1602 pour qu’il l’aidât à assumer les frais d’obsèques. Par une triste ironie, sa pièce majestueusement mélancolique servit plus aux générations suivantes qu’à sa propre famille. Les trois autres pavanes réunies ici sont de Robert Johnson. Dowland et lui étaient les Bach et Haendel de leur temps et il ne faut pas s’étonner d’apprendre qu’il fut capable, tout comme Haendel, de la plus extraordinaire profondeur même si sa microgestion du moindre détail de l’exécution des masques (de l’achat de cordes à l’écriture de vastes pans de musique), mais aussi ses fonctions administratives et sa production de musique pour The King’s Men, la compagnie de Shakespeare, nous prédisposent à imaginer un génial homme de théâtre plutôt qu’un génie. Ses deux pavanes en ut mineur explorent la noirceur des cordes inférieures du luth. L’écriture manuscrite de la seconde est une version peu élégante due à un secrétaire, ce qui semble cadrer avec l’obsédant côté provisoire d’une partie du matériau—lignes de contrepoint qui s’évanouissent au lieu de se développer, morceaux de style brisé, rythmiquement fragiles, où les parties intérieures et les mélodies serpentent en traînant autour de la basse. Partout planent des échos du thème des Lachrymae de Dowland, laissant le sombre sentiment d’un monde plus complexe que lorsque la mélodie première fut écrite. Dans la Pavane en fa mineur, je n’ai pu me passer des «divisions» du Livre de luth de Lord Herbert of Cherbury, éloquents témoignages d’une tradition où une composition aiguillonne l’imagination de son auteur ou celle d’un autre interprète. La Gaillarde de Daniel Bacheler présente la même mélodie que la mise en musique (toujours de Bacheler) de «To Plead my Faith», l’une des sonnets dans lesquels le comte d’Essex avait coutume, comme l’observa fameusement Fulke Greville, de «faire évaporer ses pensées», surtout celles relatives au traitement injuste que lui infligea la reine Élisabeth Ière. Dowland enfla la complexité de cette œuvre avec sa propre Gaillarde, puis l’auteur du ML en remit une couche avec son caractéristique travail à la main gauche. On peut presque entendre Margaret murmurer «les garçons, les garçons»—à moins que, dûment impressionnée, elle ne débitât ces deux pièces à toute allure. La mélodie même semble avoir appelé l’improvisation car on la retrouve dans le chansonnier de Giles Earle (vers 1615–26) avec des «divisions» élaborées qui sont un mélange tout aussi stimulant d’émotion, de difficulté, de brio et de drôlerie. À cette époque, luthistes et chanteurs exploraient vivement la démonstration technique et la sincérité émotionnelle: comme quelqu’un qui, à force de cajoleries, a amené ses collègues-chanteurs à l’imiter, cet enregistrement invite à porter son luth à sa bouche. Pour The Battle, il existe plusieurs sources antérieures à ML. La Gaillarde de Dowland, parue dans la Varietie of Lute Lessons (1610) de Robert Dowland sous le titre de The King of Denmark’s Galliard, apparaît ici sous son autre intitulé, The Battle Galliard, ce qui établit avec The Battle un lien aussi explicite que l’air en appel de trompette commun aux deux œuvres. Selon John Ward, une version de The Battle était peut-être jouée dans le cadre d’un spectacle—ce qui n’a rien d’impossible, même si c’est une manière aimable de dire qu’il ne se passe pas grand chose, musicalement parlant. Il est indéniable que la musique eut sa part dans le rendu et l’assimilation d’expériences culturelles qui étaient, à leur manière, fort théâtrales. La tension est palpable lorsque les appels de trompette et les manœuvres stylisées se poursuivent encore et encore, jusqu’à ce que la véritable bataille explose avec la force de cette attente contenue, avant de se terminer assez vite, avec comme un passamezzo de victoire incapable d’endiguer toute l’énergie qui vient d’être libérée. Les maîtres de danse français instillèrent le rythme de la courante/coranto dans les veines de l’aristocratie durant les longues répétitions des masques rendues obsédantes par la combinaison d’ambiguïté rythmique et de caractère mélodieux. Très évidemment associée à d’enjoués rythmes sautillants, la courante fut considérée comme assez vaste pour pouvoir s’adapter au genre de Testament que la génération antérieure avait plus naturellement relié à la pavane (cf. les pièces de Holborne et de Perrichon). Le côté direct de certaines de ces mélodies convient, à mon sens, au dessus de luth, l’instrument avec lequel Jacques Gaultier ravit le public d’Angleterre durant les trente années qu’il passa dans ce pays, à partir de 1617. Ses collègues furent, semble-t-il, beaucoup moins séduits—on ne compte plus les récits de rixes meurtrières et d’intrigues royales, mais son charme tout français était indubitable. Dans ce creuset transmanche et transgénérationnel, on jeta de vieux airs à succès comme celui de John come kiss me now, des mélodies popularisées par le théâtre (The Noble Man, Gray’s Inn Maske, The Prince’s Almain et Hit it and take it) et Tom of Bedlam. The Noble Man a pu être conçue pour une pièce de théâtre éponyme, aujourd’hui perdue, de Tour neur, ou pour un masque donné en 1613. Les airs étaient tirés presque sans délai des masques ou des pièces qui les avaient vus naître—The Prince’s Almain de Johnson apparaît dans ML sous l’appellation «Allmayne by Robert Johnson», preuve que leur durée de vie dépendait de ce qu’ils symbolisaient: une représentation théâtrale d’élite et une mélodie mémorable. Ce qui montre en particulier que leur œuvre source était de moindre importance—d’où, pour les spécialistes, ce que Peter Walls a appelé un «mauvais rêve» avec des attributions soit limitées, soit erronées. À charge pour l’interprète de s’en emparer vaille que vaille pour les restituer avec sa propre voix. Als die British Library 1912 Add MS 38539 anschaffte, wurde spekuliert, dass die Initialen „ML“ auf dem Deckblatt sich womöglich auf Matthew Locke bezogen. Obwohl dies ein schöner Versuch war, es in das Modell „Große Gestalten aus der Musikgeschichte“ einzuordnen, wurde diese Zuschreibung revidiert, als sich herausstellte, dass diese Initialen schon vor Lockes Geburt gestempelt wurden, und das Manuskript erhielt wieder seinen weniger ansprechenden Katalogtitel. Als die Alte-Musik-Bewegung in Gang kam und „Nicht ganz so große Gestalten“ ins Bild rückten, hieß es schließlich „Sturt-Lautenbuch“ in der Hoffnung oder Annahme, dass Sturt, einer der Lautenisten Prinz Heinrichs, es in den 1620er Jahren zusammenstellte (eine Handvoll der Stücke sind von ihm). Robert Spencer nannte es in seiner Facsimile-Ausgabe von 1985 schlicht „ML“, mit einer vorsichtigen Assoziation mit einer gewissen „Margaret“ (oder „Margareta“ oder „Marg“), die auf einigen Seiten ihren Namen gekritzelt hatte. Dies war im Einklang mit einem neueren Konzept, das sich eher darauf konzentrierte, wofür und für wen solche Bücher zusammengestellt wurden, statt auf einen einzigen Komponisten, der sie schrieb, und stellt sie in Zusammenhang mit anderen Büchern, die Jane Pickeringe und Margaret Board (Laute), Elizabeth Rogers (Virginal) und Lady Ann Blount (Gesang) gehörten, und in denen ein bemerkenswertes Niveau von Virtuosität in Verbindung mit privaten Aufführungen durch Frauen zur Schau gestellt wird. In diesem Buch finden sich viele große Gestalten und großartige Weisen, aber „Margaret“ ist mir in all den Jahren seit es mich zu faszinieren begann, im Sinn geblieben. Einige der Stücke im Buch könnten Aufzeichnungen aus Margarets Lautenunterricht sein—womöglich bei Sturt, bestimmt aber bei einem Mitglied im inneren Zirkel am Hofe Jakobs I., wo Masques, Theater und Avantgarde-Kammermusikaufführungen geplant wurden. Ihre Namensschwester Margaret Board übte ebenfalls ihre Unterschrift in ihrem Lautenbuch, aber ihre Geschichte als Lautenistin endete unzweideutig mit ihrer Hochzeit, und ihr Buch wurde weitergegeben. ML wurde nicht einfach von einer Person an die nächste übergeben, wenn sie damit fertig waren: fünfzehn verschiedene Schreiber waren daran beteiligt, und einige schienen sogar gleichzeitig Musik einzutragen; zum Beispiel füllten sie gelegentlichen Freiraum am Ende einer Seite aus und überreichten dann das Buch dem nächsten oder vorherigen Schreiber. Was auch immer der Zweck der Sammlung, sie ist ein kollaborativer Band par excellence. Margaret könnte Mäzenin, Zeugin, oder gerade verfügbare Schülerin gewesen sein: Lautenisten diskutierten den neuesten Stand ihrer Kunst, machten gegenseitige Kommentare über ihre Musik, borgten Melodien voneinander und wunderten sich vielleicht wo sie alle nach dem selbstbewussten Goldenen Zeitalter der elisabethanischen Lautenmusik geblieben waren. Lauten hatten sich seit John Dowlands Jugend eine extra Bass-Saite angeeignet, was bedeutete, dass sowohl älteren als auch neueren Weisen Bassnoten hinzugefügt wurden: von wegen „originale“ Absichten der Komponisten. Geläufiges Passagenwerk (der Renaissancestil der „Diminutionen“ [zierreichen Variationen]), das Daumen und Zeigefinger verwendet, wird neben neueren Trends eingesetzt, die den Daumen nur für den Bass verwenden, während die Finger der rechten Hand die schnellen Notenwerte spielen. Eine expressive—oder je nach Geschmack, hyperaktive—Schicht von Verzierungen der linken Hand wird überlagert. Eine der wichtigsten konkordanten Quellen für das Buch, Kraków Mus. MS 40641, besitzt weder die punktierten Rhythmen im französischen Stil noch die Ornamentation der Tänze in ML. Die Musik wird oft anhand der plausiblen Logik von Adolf Loos’ provokativ tituliertem Aufsatz Ornament und Verbrechen (1908) ohne, oder mit relativ wenigen Verzierungen, gespielt. Dieser Aufsatz wird weithin mit dem Arts and Crafts Movement assoziiert—das selbst mit der Entdeckung und Rekonstruktion alter Instrumente verbunden ist, und das Mode von Substanz und Zweckmäßigkeit zu unterscheiden suchte. Während die Art von Verzierung, die sich in ML findet, zweifellos eine Mode war und die Glätte, die Loos in fassbaren Objekten so sehr schätzte wie wir vielleicht in musikalischen Melodien, lässt sich auch aus dieser obszessiven Manipulation des natürlichen Verklingens der Saite viel gewinnen. Die Erforschung emotionalen Ausdrucks in Vorschlägen der linken Hand sollte in der nachfolgenden Schule französischer Lautenisten mit der Schilderung von Gefühlen assoziiert werden. Hier scheint es, als ob zwei Photographien übereinander projiziert wurden, da dieser nahezu barocke Gebrauch von Verzierungen musikalischen Formen der Renaissance überlagert wurde. Mersenne bemerkte, dass es manchmal schwierig war, zu entscheiden, ob ein Vorschlag einen Ganzton oder Halbton von der Hauptnote entfernt beginnen sollte, was uns daran erinnert, dass trügerisch modern klingende Melodien nicht immer für unser Tonartenverständnis bestimmt waren; Leittöne wurden in Skalen bis viel später im Jahrhundert nicht automatisch erhöht (die Forschung scheint sich auf verschiedenen Daten um 1680 anzusiedeln), was die Palette der verfügbaren Farben durch eine größere Wahl von Vorzeichen je nach dem Charakter der musikalischen Phrase erweiterte, oder schlicht die Klangfarben auszunutzen, wo auf der Laute eine Verzierung lag. Im Buch werden der Musik von Robert Johnson Coulés in französischer Manier und Vorschläge hinzugefügt. Obwohl er eine Anstellung bei Hof hatte, scheint der renommierte elisabethanische Lautenist Antony Holborne laut seiner „verzweifelten und verwahrlosten Witwe“, die 1602 an Robert Cecil schrieb und um Erstattung seiner Begräbniskosten bat, ohne viel Besitz verstorben zu sein. Es ist eine traurige Ironie, dass sein hier aufgenommenes nobel-melancholisches Stück späteren Generationen mehr einbrachte als seiner eigenen Familie. Die anderen drei Pavanen sind von Robert Johnson. Johnson und Dowland sind der Händel und Bach ihrer Welt. Es sollte nicht überraschen, zu erfahren, dass Johnson, wie Händel zu außerordentlicher Tiefgründigkeit fähig war, aber sein Mikromanagement aller Aspekte einer Masque-Vorstellung—vom Kauf der Saiten bis zur Komposition von Schwaden von Musik—und seine administrativen und Musikproduktionspflichten für „The King’s Men“ der Shakespeare Company machen uns dafür anfällig, uns einen leutseligen Theatermenschen vorzustellen statt ein privates Genie. Beide c-Moll-Pavanen erkunden den dunkleren Klang der tiefen Saiten der Laute. Die Handschrift der zweiten ist eine wenig elegante Version von „secretary hand“ [einer im 16–17. Jahrhundert in England geläufigen Kurrentschrift], die der stellenweise eindringlichen provisorischen Natur im Satz zu entsprechen scheint: kontrapunktische Linien, die wegschmelzen, statt verarbeitet zu werden, sowie rhythmisch zerbrechliche Fragmente von style brisé, in dem sich die inneren Stimmen und die Melodien versetzt um den Bass winden. Echos aus Dowlands Lachrymae-Thema durchdringen alles und hinterlassen ein dunkles Gefühl, dass die Welt komplizierter ist als zu der Zeit als die Melodie geschrieben wurde. In der f-Moll-Pavane konnte ich die Diminutionen in Lord Herbert of Cherburys Lautenbuch nicht umgehen, die eloquent eine Tradition bezeugen, in der die Komposition einer Person seine eigenen oder die Phantasie eines anderen Interpreten anspornt. Daniel Bachelers Galliard teilt sich ihre Melodie mit seiner Vertonung des Sonetts „To Plead my Faith“ des Earls of Essex, einem aus seiner Serie, in der Essex, wie Fulke Greville bemerkte, „seine Gedanken verfliegen“ ließ—gewöhnlich über das Thema seiner ungerechten Behandlung durch Königin Elizabeth I. Dowland verschärfte diese Komplexität in seiner eigenen Galliard, und der Schreiber in ML fügte dem Wettstreits mit seinem Markenzeichen einer behenden linken Hand eine weitere Facette hinzu. Man kann fast hören, wie Margaret sie ermahnt („Kinder, Kinder“) oder vielleicht war sie entsprechend beeindruckt und spielte beide durch. Die Melodie scheint oft Improvisation angeregt zu haben, denn sie überlebt in Giles Earles Liederbuch (ca. 1615–26) mit komplizierten Diminutionen, die eine gleichermaßen herausfordernde Mischung bewegender, schwieriger, brillanter und alberner Variationen bieten. Lautenisten und Sänger in dieser Zeit erkundeten eifrig Aspekte technischer Schaustellerei und emotionaler Aufrichtigkeit, und da ich Sängerkollegen oft überreden musste, gleiches zu tun, muss ich in dieser Aufnahme zu einem gewissen Grade meinen Worten Lautentaten folgen lassen. Für The Battle gibt es mehrere frühere Quellen als ML. Dowlands Galliarde, die in Robert Dowlands Varietie of Lute Lessons (1610) als The King of Denmark’s Galliard erschien, hat hier einen anderen Namen: The Battle Galliard stellt durch das ihnen gemeinsame Trompetensignal eine explizite Verbindung mit The Battle her. John Ward legte nahe, dass eine Fassung von The Battle während eines Spektakels hätte gespielt werden können, was nicht unwahrscheinlich ist, ist aber eine nette Art, zu sagen, dass musikalisch wenig passiert. Ohne einen musikalischen Schmetterling auf dem Rad der Kulturtheorie zerschmettern zu wollen: Musik hatte zweifellos ihren Anteil an der Spiegelung und Verdauung kultureller Erfahrungen, die auf ihre eigene Art und Weise hochtheatralisch waren. Im stetigen Austausch der Trompetensignale und stilisierten Manövern wächst die Spannung spürbar an bis die Schlacht selbst mit der Gewalt dieser aufgestauten Erwartung explodiert; sie endet bald mit einer Art Sieges-Passamezzo, dem es nicht gelingt, die Energie zu bewahren, die gerade erst losgelassen wurde. Die französischen Tanzmeister instillierten während der langen Proben für Masque-Aufführungen den Courante/ Coranto-Rhythmus in den Knochen der Aristokratie, und mit ihrer Kombination von rhythmischer Zweideutigkeit und Melodiosität wurden sie zu einer Art Manie. Die Form wird am offensichtlichsten mit fröhlichen sprunghaften Rhythmen assoziiert wurde aber als groß genug erachtet, um die Art musikalischen Testaments zu beinhalten, das die vorangegangene Generation naturgemäß eher in einer Pavane untergebracht hätte (siehe die Stücke von Holborne und Perrichon). Mir schien, dass die Direktheit einiger ihrer Melodien auf die Sopranlaute passen, einem Instrument, mit dem Jacques Gaultier in seinen 30 Jahren in England ab 1617 sein Publikum begeisterte. Seine Kollegen scheint er weniger begeistert zu haben—es gibt zahlreiche Berichte von blutrünstigen Streitigkeiten und königlicher Intrige, aber das gallische Charisma, das er mit sich brachte, war unausweichlich. In diesen kanal- und generationsüberquerenden Schmelztopf wurden alte Favoriten wie das Lied John come kiss me now, Melodien, die das Theater berühmt machte (The Noble Man, Gray’s Inn Maske, The Prince’s Almain, und Hit it and take it) und Tom of Bedlam geworfen. The Noble Man könnte für ein heute verschollenes Schauspiel mit dem gleichen Titel von Tourneur oder eine 1613 aufgeführte Masque geschrieben worden sein. Die Tunes (Lieder) lösten sich praktisch gleich nachdem sie geschrieben wurden von der Masque oder dem Theaterstück los, für die sie entstanden—Johnsons The Prince’s Almain erscheint in ML als „Allmayne von Robert Johnson“—was zeigt, dass ihre spätere Existenz davon abhing, was sie repräsentierten: hochrangige Theateraufführung und eine eingängliche Melodie. Aus welcher Unterhaltung sie genau stammten war weniger wichtig, was laut Peter Walls zu „Alpträumen“ (spärlichen oder missverständlichen Zuschreibungen) für Forscher führte. Die Aufgabe des Spielers war, sie sich irgendwie anzueignen und ihnen ihre eigene Stimme aufzuprägen.